Hey guys, and Happy Friday! Phew – this first full week back in the New Year has been a great one. I for one am so excited to be back on a schedule and have already found my 2015 groove; the holidays were so nice and relaxing, but this gal needs some structure! (Although I am still waiting for my 2015 planner to arrive in the mail and not having a planner is driving me bonkers!). Before I dive into today’s reveal, a quick THANK YOU to those of you who left comments on Wednesday’s post! I really appreciate you taking a quick moment to leave me a quick line – already I feel more connected to you guys. And quite a few of you were “long lost” friends that I didn’t know read the blog, so that was a fun surprise! If you didn’t get a response from me, it’s because you’re a “No-reply” commenter – check back to your comment on Wednesday’s post to see my response! Alright…enough chatting and business this week, let’s get to a recent big change in our little house. 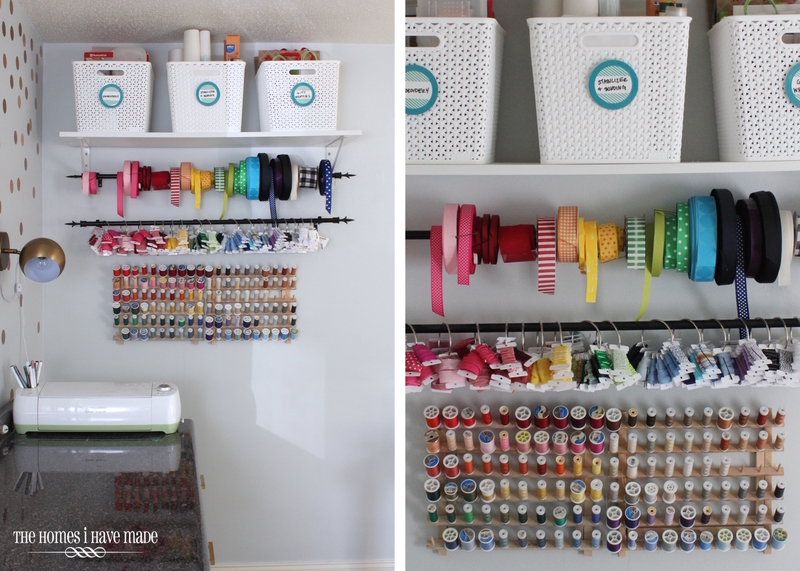 Raise your hand if you didn’t believe me when I proclaimed the Craft Room “DONE” a few months back? 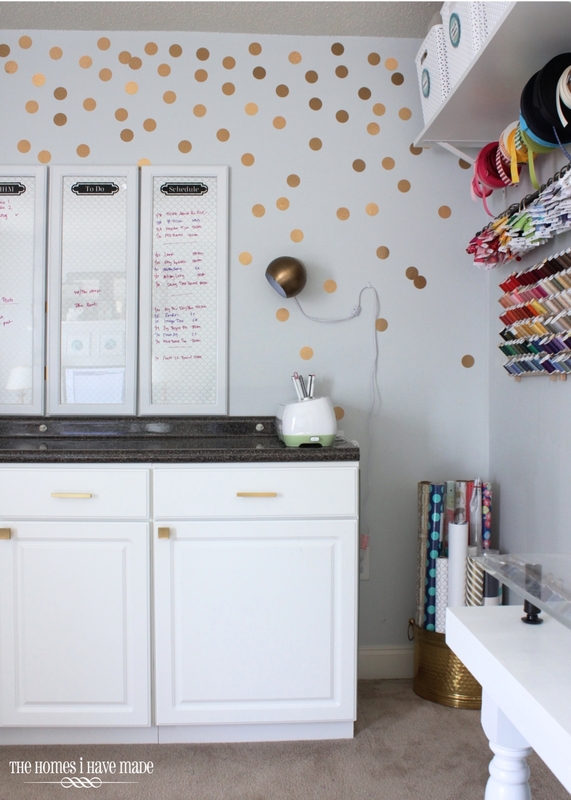 Raise your hand if you’re tired of my Craft Room updates proclaiming it’s the last one? I know. I know. I’m sorry, friends. But I have another one. If there’s one thing you should know about me if you don’t already, it’s that I can’t leave something alone until it’s right. I will try and try and try things over and over and over until it “clicks.” Well, it took me over 2.5 years, but I think it has finally clicked. 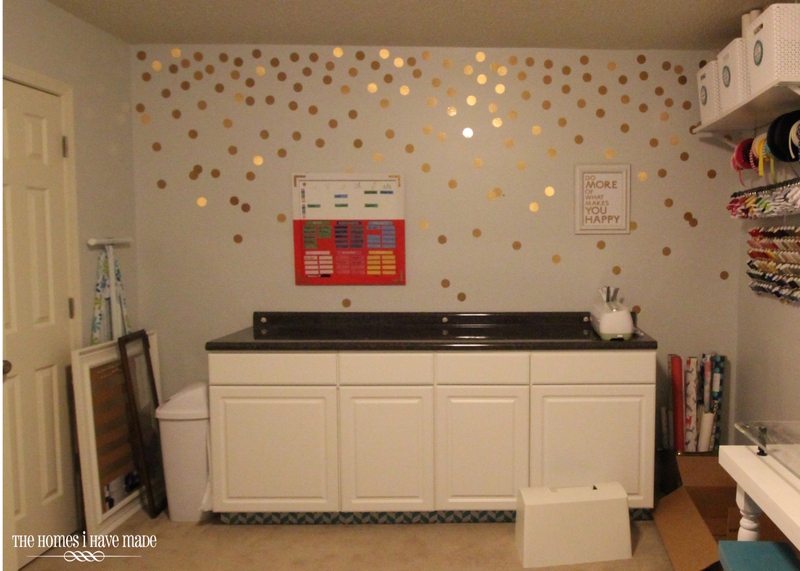 Take a look at my “new” creative space! You all are probably thinking I’m nuts…and I am. But hear me out on this one! To jog your memory (or to catch up those of you who are new around here), this is what my “craft station” look like until right after Thanksgiving. 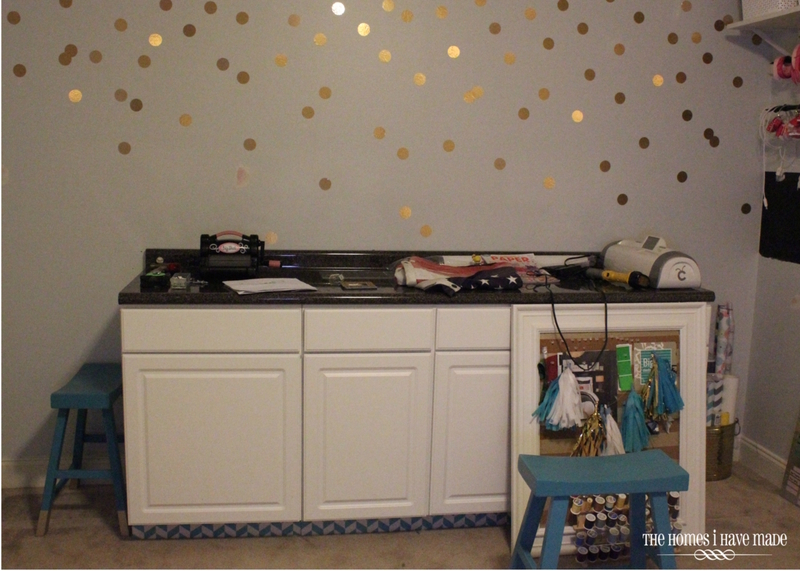 The craft counter stretched 12′ (yes, you read that right: 12 feet) down the right-side wall of our spare bedroom; my polka-dot feature wall was across the back, along with my office storage towers. In my “two-years in this house” re-cap post, you all might remember me saying that while this room is a complete luxury that I am so incredibly lucky to have, it didn’t feel quite right to me. I wasn’t able to use the counter as work surface because it was holding my two sewing machines, my Cricut and my large cutting mat; I never really sat at the two workstations we created by gapping the cabinets; the sewing machine was a bit too high on the counter; and overall, the visual clutter of the whole wall made my head spin a bit. While I tried and tried to get this room right, it never felt spot on. That’s probably why I have visited it over and over…both in real life and here on the blog! After Greg got home from deployment, we took a family road trip. I’m not sure about you guys, but when we’re stuck in the car for hours, we chat about homes, old ones and upcoming ones, and of course, the current one. We dream and brainstorm and analyze. It’s just who we are. I was telling him that I somewhat regretted the layout of the Craft Room, which I had never fully articulated to him. So we talked and analyzed; and over the course of the 7-hour trip, we devised a plan to re-arrange the room. It looks like a pretty dramatic overhaul, but it really wasn’t. Let me show you. We pulled the craft towers off the back wall and moved them elsewhere in the room. 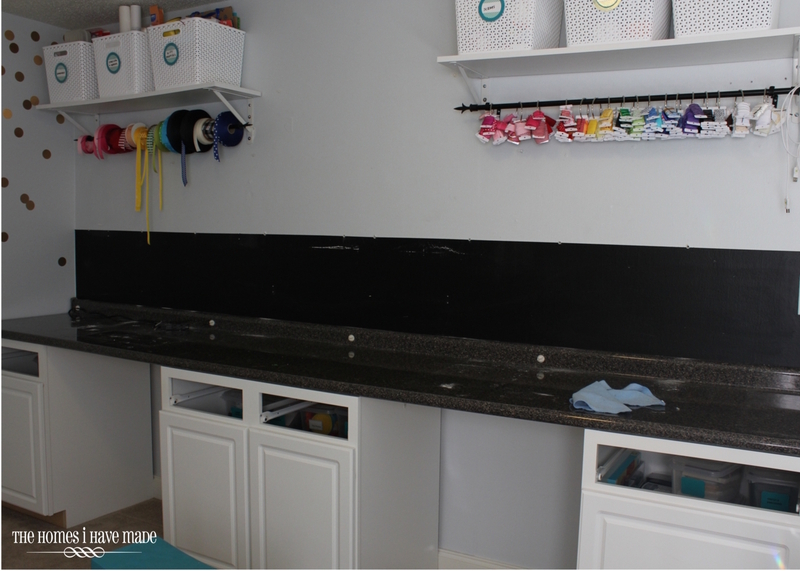 We then pulled almost everything off the craft wall, including the picture ledges, bunting, shelves, accessories, and pin-board backsplash…only to reveal the chalkboard backsplash I had painted (and hated) underneath. Whoops! We moved the cabinets to the back wall and put them tight next to each other. We cut the countertop down with our circular saw and bolted everything back together. If you can beleive it, this move took us about an hour or so, and this alone made me so incredibly happy. I wanted the counter along the back wall from the very beginning. At the time of installation it didn’t work out for reasons I won’t go in to (ahem, poor measuring). The second these cabs were in their new home, I regretted not speaking up so much sooner! 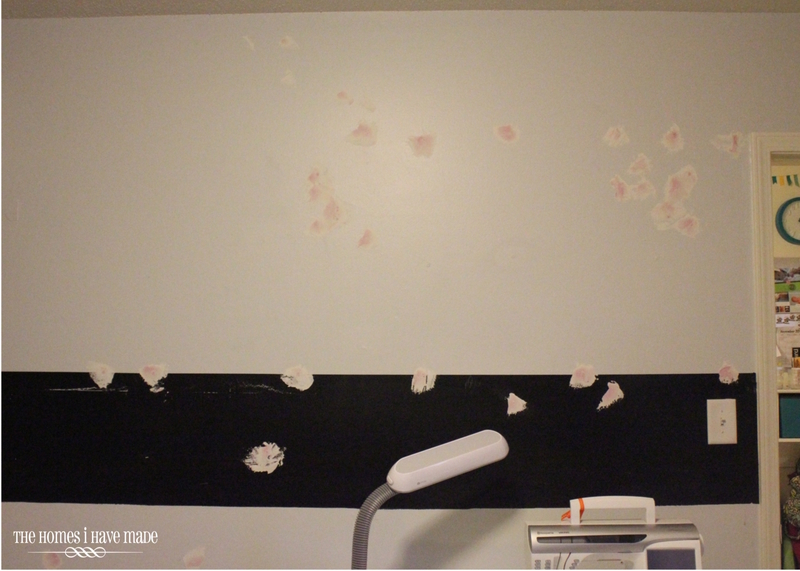 The 12 foot wall that used to have the cabinets and craft supplies was a bit battered after everything came down. 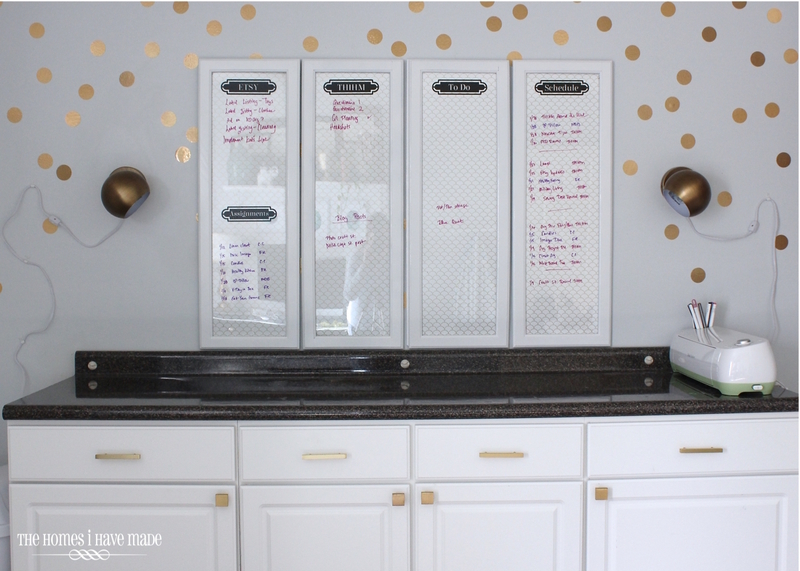 I patched the holes and painted over the black chalkboard backsplash with leftover (matching) paint. With the counter in its new home, I then set to work to find homes for the craft supplies that came off the shelves, as well as frames and art that were now all displaced. I thought I had a good plan (to incorporate some new colors – aka: pink) at this point, but it was feeling very off. I needed this work surface to be as free and clear as possible. No sewing machines, no cutting mat, no decor. I wanted a place where I could spread out and cut fabric, wrap gifts, and assemble whatever project I’m working on without having to clear a bunch of stuff off first. I wanted/needed this back wall to serve as a command center of sorts for all my projects and business stuff. 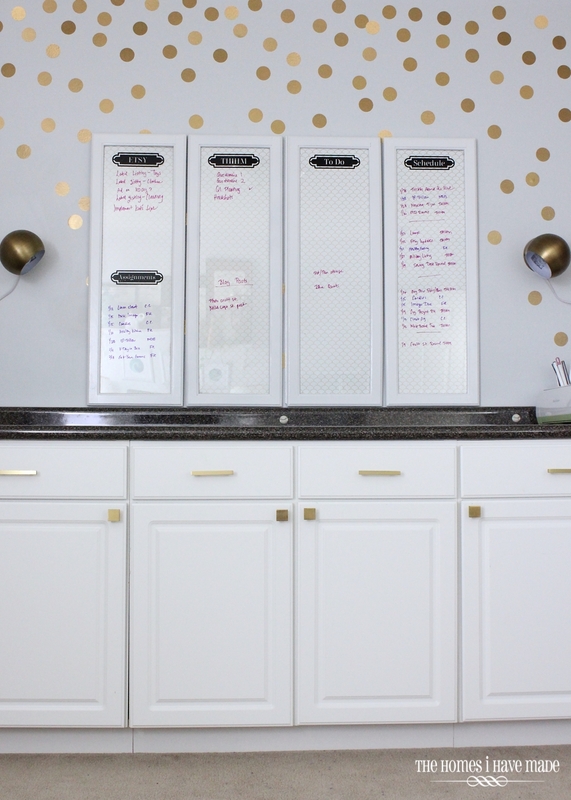 I needed a place I could jot down notes, make lists and prioritize deadlines in a simple, clean and clear way. This little space, my friends, accomplishes all of that! With the cabinets all shoved together and a nice clean work surface on top, I feel like I finally have that place where I can go and stand and pull stuff out and be creative. Although this counter is half the size of what it used to be, it’s about 10 times as functional. 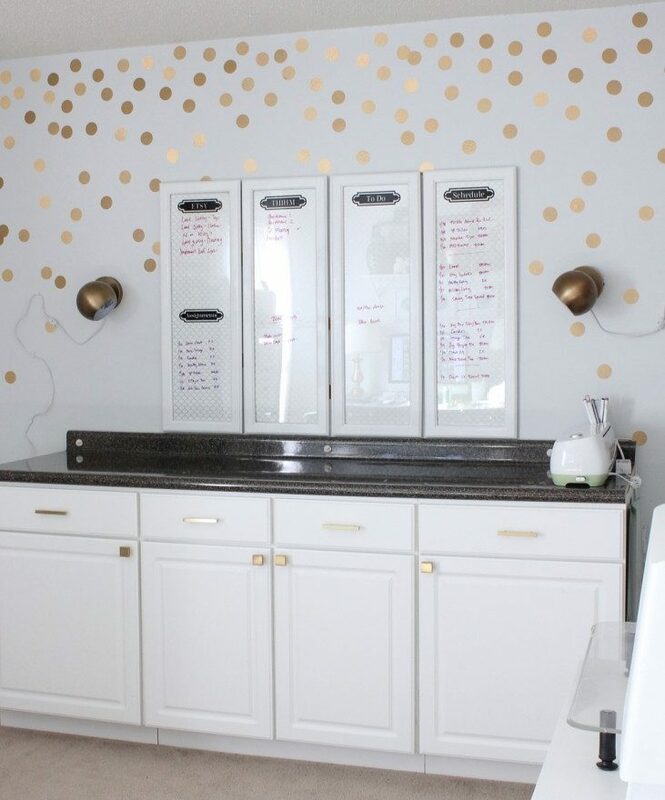 Beyond the cabinets, the big focal point is just above it…the new “white boards” I made for over the counter. I have their full story and tutorial coming up for you Monday so for now, I will just show you some pretty pictures of them. I wanted this space to feel a bit more classy than cutesy, so I (FINALLY!!!) put hardware on the cabinets. 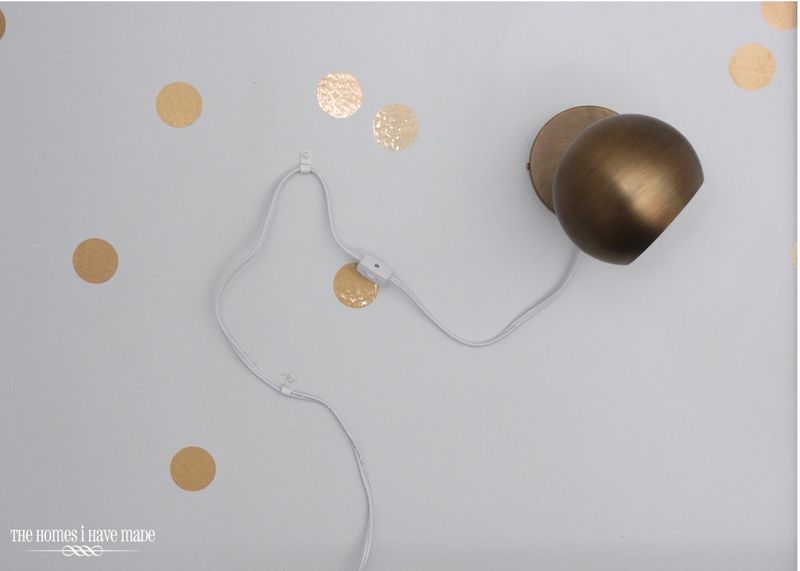 I found this set of matching brass knobs and pulls on Ebay for $20 (there were 19 pieces of hardware in the set, making it a total score!). 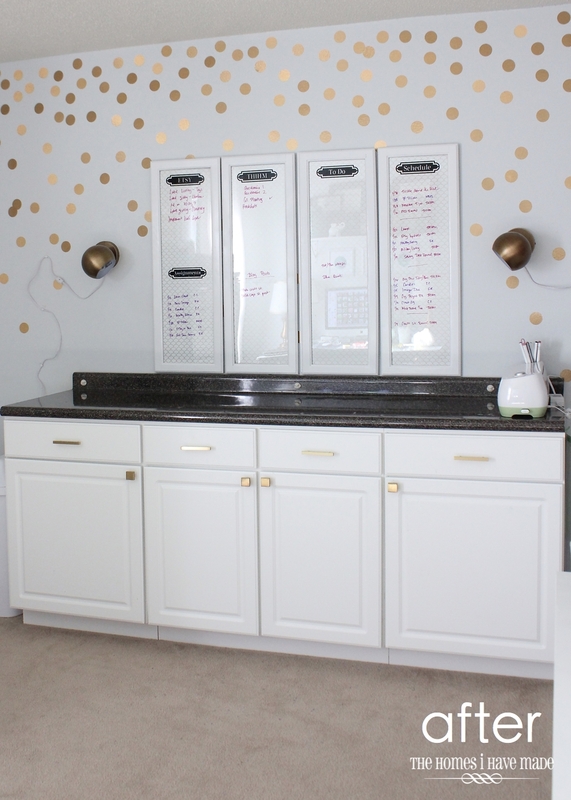 I am still in awe of how hardware completely changed the look of the cabinets! This side of the room is on the complete other end of the room from the one small window; and I was quite surprised to realize how dark it was to work at the counter, especially at night. I did not want to spend a ton of money on new light fixtures (nor did I want the headache of hanging them, knowing we are moving relatively soon). I found these oh-so-perfect wall sconces at Urban Outfitters for $34 each. 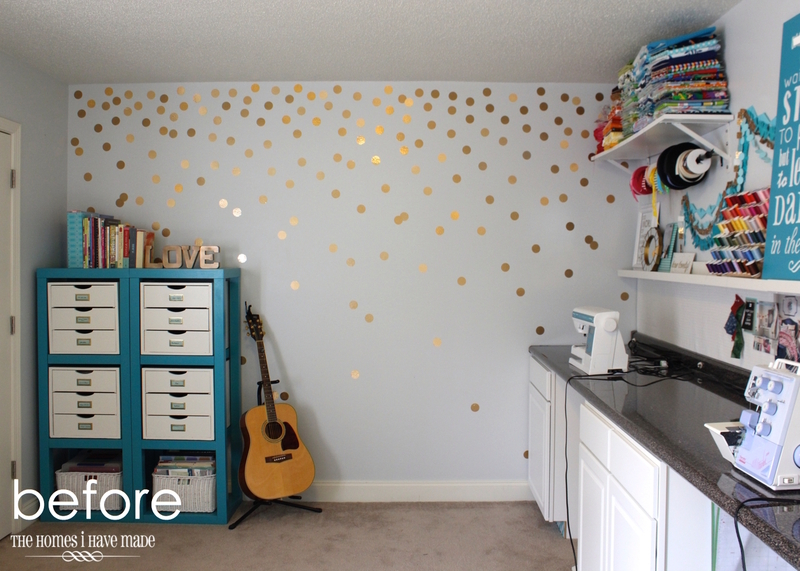 They were the right price, easy to hang, and were just the right look for this space! Sold! 85% off all my craft supplies are now concealed into the cabinets as well as the closet to the left of the counter area. If our closet was a smidge bigger, I could have gotten everything in and out of sight but it just wasn’t in the cards. We decided to leave up one shelf of baskets as well as all my pretty ribbons and threads. While I would have preferred these put away, they sure are pretty to look at! 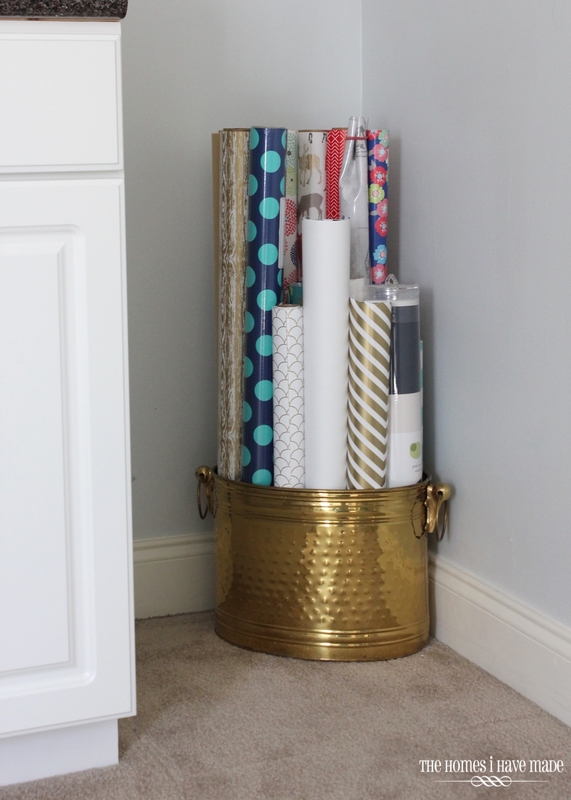 In the corner, I purposed the brass trashcan I picked up on our trip to Asheville to hold wrapping paper. I love that there is a little space on either side of the counter for this container as well as a much-needed trash can on the other side! Up until now, I have been walking out to the kitchen with all my trash, which is honestly just ridiculous! There’s obviously another 2/3s of a room that I am not showing you today. You might be wondering where some things went, as well as “So where do you sew now, Megan?” You can see in the photo below that there is indeed more to show you. I just need the weather to warm up a tad so I can finish off a few (painted) details. 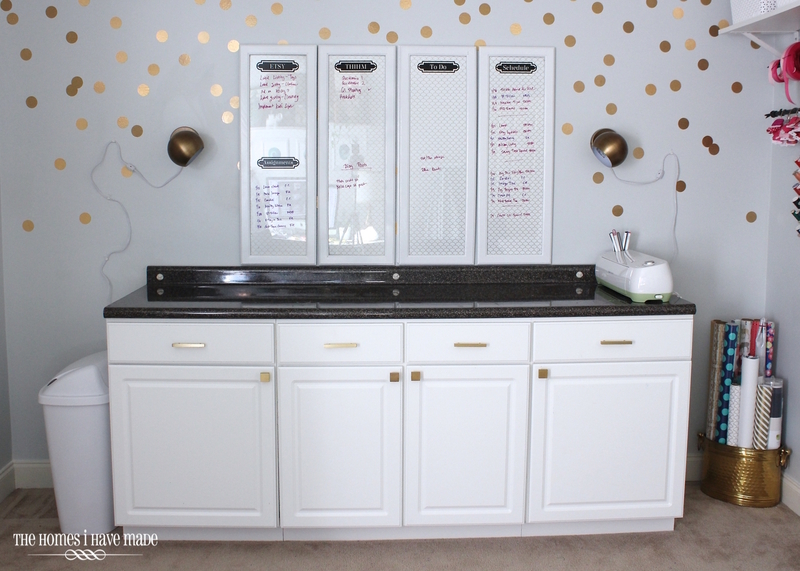 Even though this makeover may look pretty dramatic, all in all, it was more about moving things around, de-cluttering, streamlining, re-purposing some things from the garage, and adding some much-needed hardware. 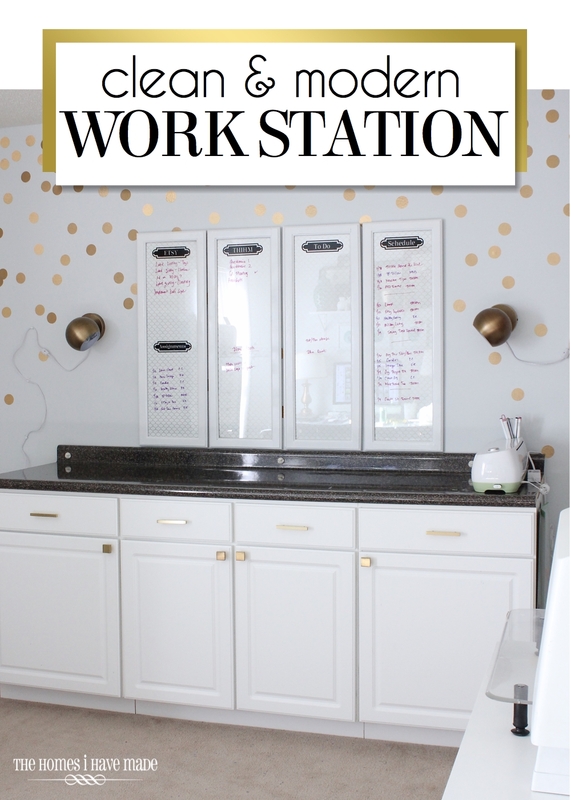 To re-vamp these cabinets into a more functional workspace cost us about $100 (hardware, sconces, paint) and 5 hours of time (spread across a few different projects). Not a big investment in time or money, and I think I have said some variant of “Why didn’t we do this sooner?” to my husband at least a million times. So what do you guys think? 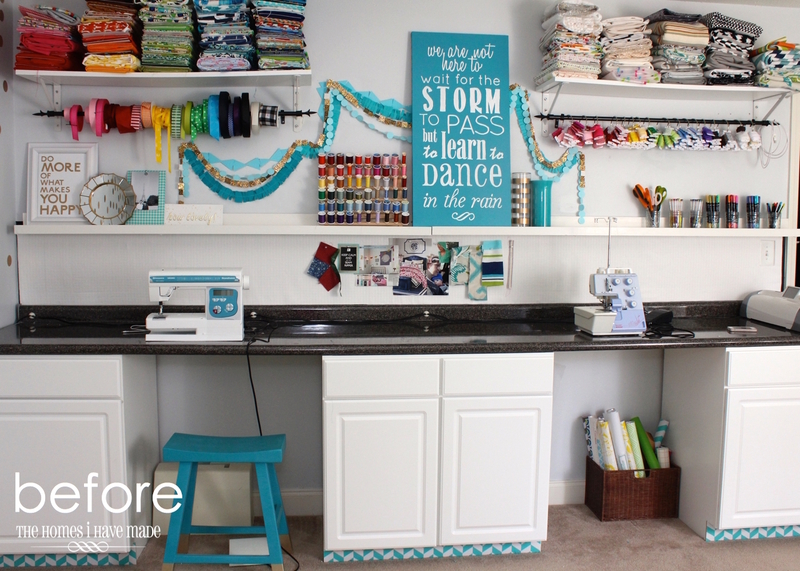 Do you miss the color and the open craft supplies or are you digging the more streamlined work space? I’d love to hear what you think! I hope you all have a fantastic weekend. If it warms up enough, I’m hoping to paint some furniture – fingers crossed. On Monday, I’ll tell you more about those white boards above the counter! See you then! Reader Survey Results AND 2015 Plans and Goals! Thanks Dorota! 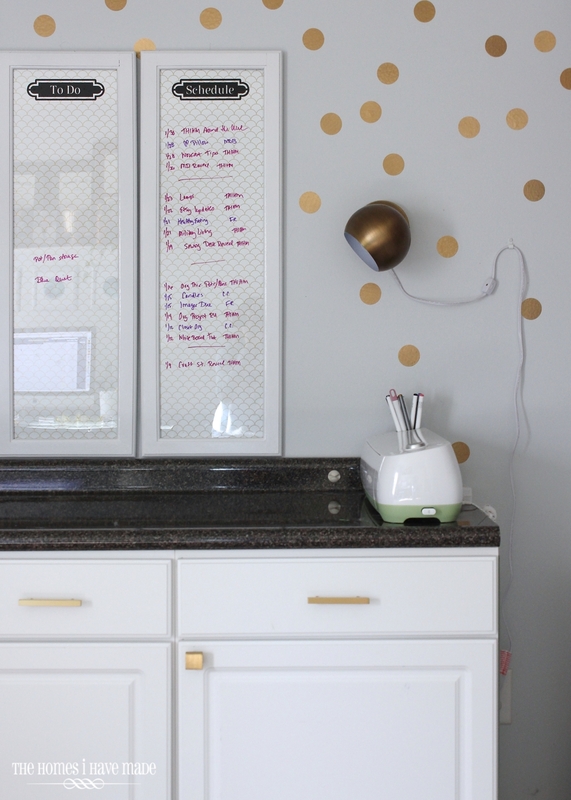 Tutorial for the dry-erase boards coming up tomorrow! Thank you so much! Everything around here is always a work in progress! I am constantly moving things around until I find just the right home!!! I do hair, and something like this is totally doable for doing hair. Meaning, you don't want a lot of color, because when you do hair color, you can make the color you are trying to achieve look all wrong. I love how simple this really is. Well done! I know what you mean about something not working quite right. My craft station is half of my tiny 8X10(ish) 3rd bedroom. I agonized for months over how to get it to work without spending a ton of money. I settled on some easy pieces from Ikea along with a drop-leaf table for extra work area that didn't take up much space unless it's being used. I think that if it doesn't work for you, change it as many times as you need to get it right. Nothing wrong with proclaiming it "done" every time either… even if it's just "done for now". 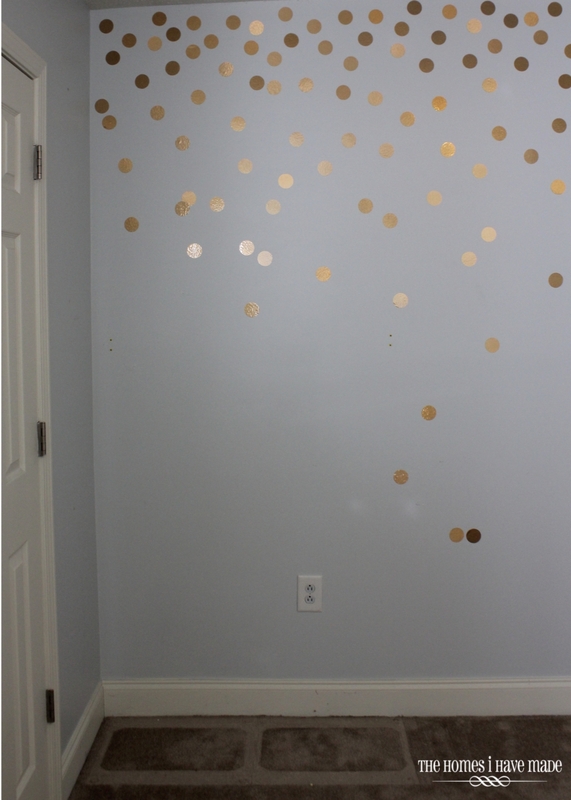 Can't wait to see the rest of the room! 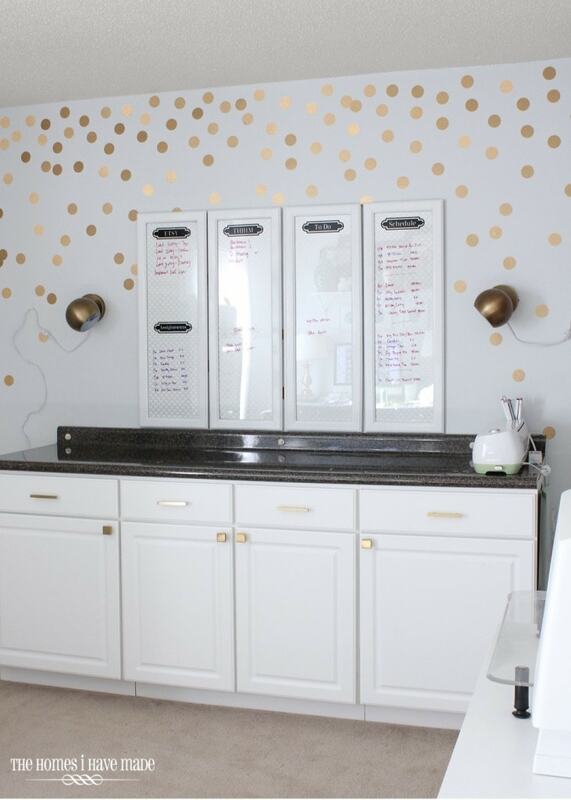 I loved the color in the old craft room, but this is more elegant and clean lined. It looks amazing!! Great job!! Thanks, Crystal! It feels so foreign to me to have such a colorless space now, but I find it's more calming to work in. There's still plenty of color on the other side of the room – I'll show you all soon! I love how you walked through your thought process on this project! So many bloggers do reveals and explain the how-to's but leave out the why. 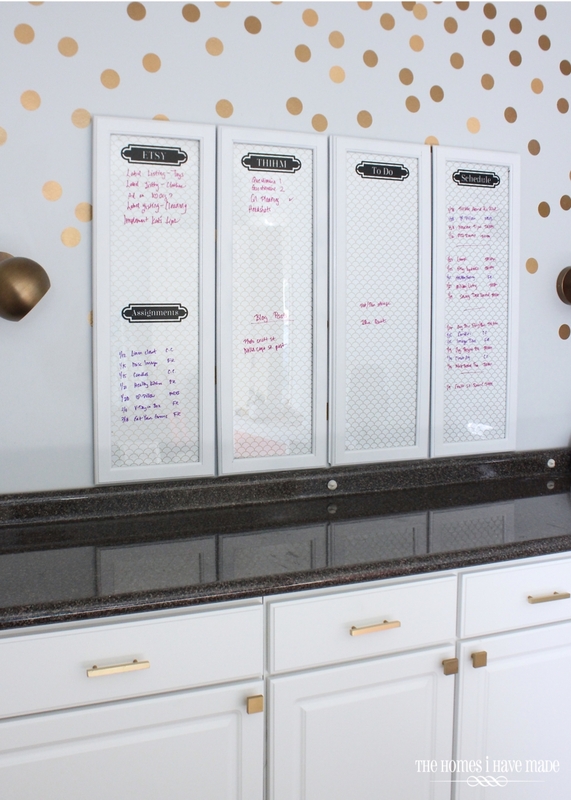 I appreciate the "backstage pass" into your planning, and it's reminding me to take the time to be intentional about what I want out of a space as I tackle some projects in my own house. I Heart Organizing sent me to your site and I have really been enjoying looking around it for a few hours now! 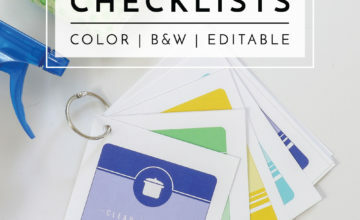 If you were patient and detailed enough to do those drawer organizers I knew you were my people 🙂 And I discovered I already had many of your projects bookmarked without connecting the dots that they were from you. 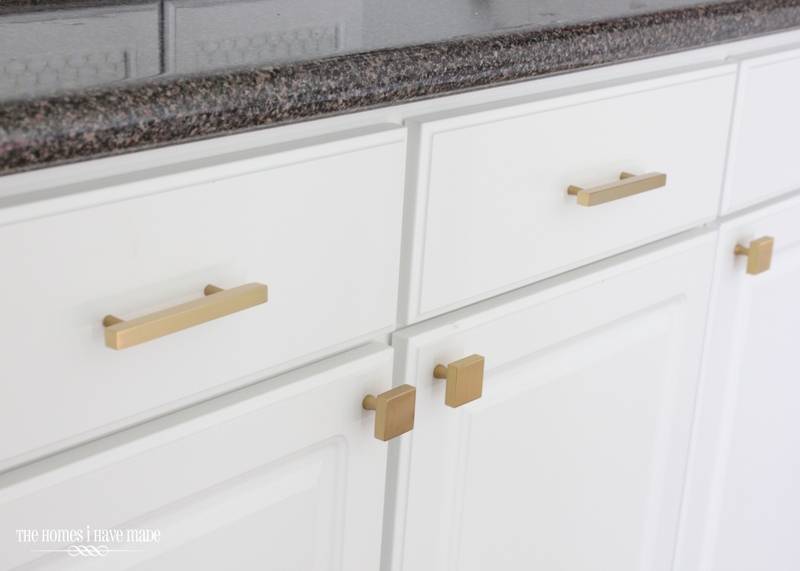 Wanted to ask if the lot of brass knobs and pulls you bought on eBay was a one-time offering or is there a seller that has these? Couldn’t find them and they are a screaming deal. Would love to hear back from you. So inspired by your projects and anxious to do a few, especially the sewing ones! Thanks for putting such a great website out there and sharing your tips. This comment totally made my day yesterday! Thank you for taking the time to pop over, look around for a while, and leave such a nice comment! I’m so glad you found me and are loving what you see! Again…I’m so glad you found me and connected the dots. Happy to have you following along. Have a great weekend!